When I travel abroad one of the biggest things for me is being able to enjoy the local cuisine. 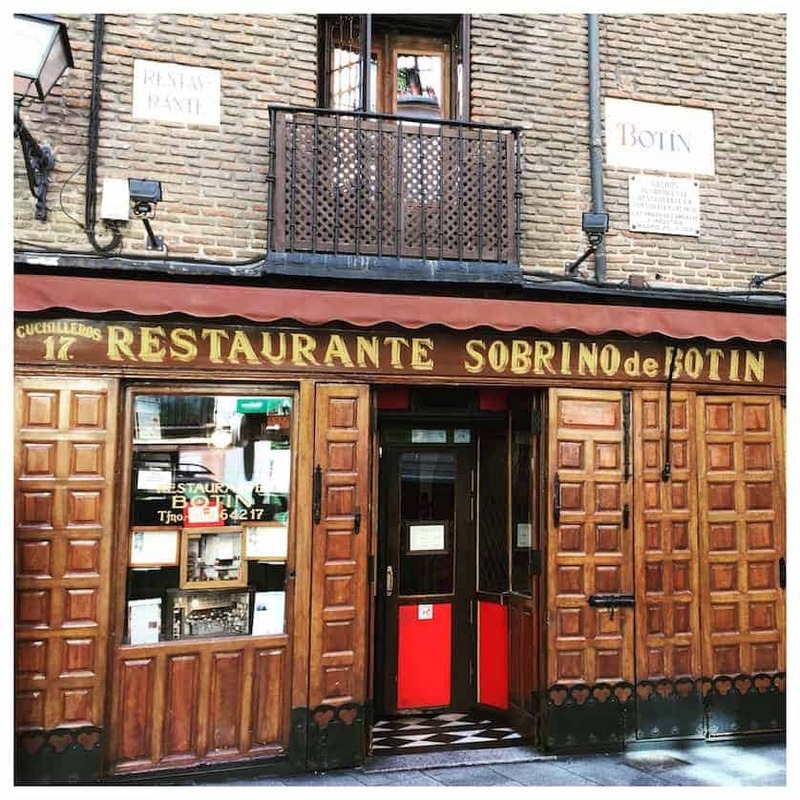 The Spanish cuisine is one of my favourites, so while I was in Madrid this summer I had to revisit Restaurante Sobrino de Botin. Botin is not only the world’s oldest restaurant, according to the Guinness book of records, but is also the home to some of the most delicious traditional Spanish food I have ever eaten. Restaurante Sobrino de Botin is located along Calle de los Cuchilleros, just off Plaza Mayor in Madrid. Botin originally opened in 1725 and is run by the González family and still offers the traditional Spanish dishes that would have been served when Botin first opened. To avoid disappointment I booked a table at Restaurante Sobrino de Botin a few weeks prior to my trip, because on my last visit I could get a table only at 11:15pm which wasn’t ideal. After visiting Mercado de San Miguel for some oysters and a pre dinner drink I arrived at Botin at 8pm for my dinner. Botin is arranged over many floors, and on every floor each room is adorned with intricately tiled walls in a range of different pattens and designs. The flooring is also beautifully tiled and the ceilings have exposed original beams. This traditional decoration gives Botin an atmospheric ambiance as if you have gently stepped back in time. Upon arrival I was seated at a table on the 1st floor and was promptly given a menu and wine list. For my starter I ordered their famous garlic soup with quails egg, and I then enjoyed a mouthwatering steak in a delicious mushroom sauce for my main course. As well as being absolutely delicious the food was beautifully presented on Botin’s own branded crockery. I’m not the biggest lover of deserts, so on this occasion I didn’t have a dessert, but I did enjoy my meal with a beautiful bottle of Rioja. The food was absolutely stunning and I couldn’t find a fault in any of it, however on this occasion I felt that the service left much to be desired. I’m not sure if it was the fact that I was in the first sitting and they just wanted me in and out as quickly as possible, but right from the start of the evening the whole experience felt rushed. This did have a negative effect on the evening, and if it wasn’t for the fact the food was so delicious it would have really turned out to be quite an unenjoyable evening. Would I go back to Restaurante Sobrino de Botin again? Yes I would because the food is totally out of this world. I hope that the rushed service that I experienced on this visit was just a one off, and that if I visited again it would be a much nicer, relaxed atmosphere. Beautiful quaint little restaurant. I dined there a while ago. Great food and the atmosphere was perfect even serenaded while eating. Definitely recommend this place. It is so good, I really hope the rushed service this time was a one off, the first time I visited it wasn’t rushed at all! It is a shame when you go somewhere, you look forward to it, then they rush you that is not good. A meal out is not meant to be rushed should be a pleasurable experience. You will just have to go again. Absolutely! A good reason to go back! Gonna find it when next there, love traditional. Read that they do a suckling pig sounds tasty. It is literally 30 seconds from Plaza Mayor – I had the suckling pig the first time I visited, it was delicious! Mmm well that’s a defo then when I next visit. Thanks.